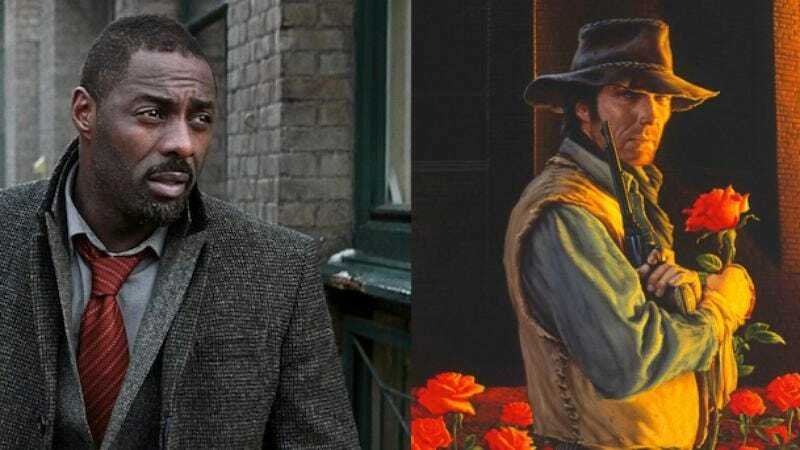 According to Deadline, Idris Elba is currently the frontrunner to star as the Gunslinger himself, Roland Deschain, in Sony’s adaptation of Stephen King’s Dark Tower books. This comes almost a month after a report came out that Sony was trying to get Matthew McConaughey for the role of The Man In Black/Randall Flagg, an (almost) immortal villain who pops up in a ton of different King books, not to mention the endless internet arguments about whether or not Elba should play the next James Bond. Roland may not be a suave and womanizing spy, but he is a rugged cowboy who carries around a pair of revolvers made from his universe’s equivalent of Excalibur, so that’s a bit cooler than a watch that shoots lasers or whatever. For those who haven’t read the Dark Tower books, Roland is basically Frodo from Lord Of The Rings if he were played by Clint Eastwood when Clint Eastwood was a badass. Also, he’s trying to stop all of reality from falling apart instead of taking a ring to a mountain, and he fights mutants and homicidal trains instead of orcs and goblins. He’s the classic gunslinger archetype, with the endless competence and effortless cool, but he exists in a sci-fi/fantasy world where nothing makes sense. It’s great when it works, and it’s utterly bizarre when it doesn’t, both of which would make for an interesting movie. Roland is also just as important to this series as Frodo is to his, so it’s key that the actor playing him can still be likable despite his inherent steeliness. Elba in the role makes almost perfect sense, then, which is an interesting contrast to how weird it’ll be if McConaughey does end up playing the villain. Of course, this could all end up being for nothing, since this Dark Tower adaptation has been in the works for many years and isn’t necessarily any more likely to happen now than it was all of those other times. If it really gets made, though (and that’s still a big if), the first film in what will have to be a long series will be directed by Nikolaj Arcel and be released on January 13, 2017.